Healthcare institutions need to be able to combine multiple forms of patient content including clinical images, videos, photos, documents, and medical device output into one, scalable platform. So when it comes down to it, where can you turn for this ability? 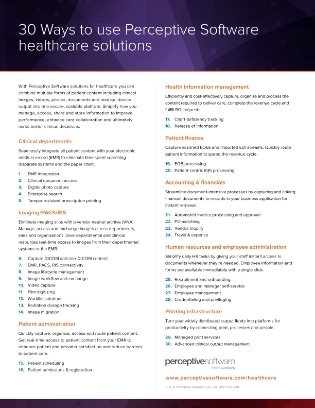 Check out the following white paper to explore how Perceptive Software can help healthcare organizations simplify how they manage, access, share, and store information. Additionally learn how this software can help improve performance, enhance care collaboration and more.